No reason why one can’t enjoy the sunshine on a work day. 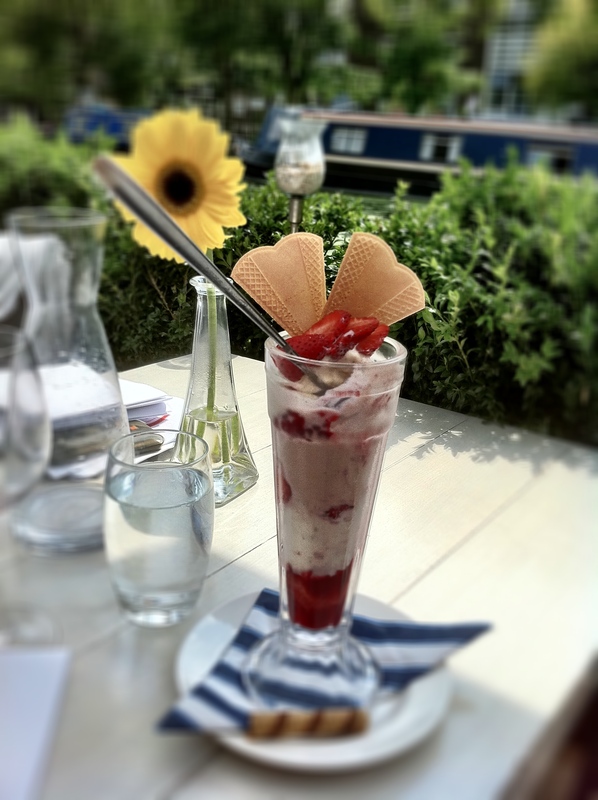 My colleagues and I decided it was too nice to spend the day cooped up in the London office so we decided to have an impromptu team lunch and headed to The Summerhouse restaurant on Union Canal. It’s a short 10 minute walk from my office and it’s only open from April to November, and is located right next to the water in London’s Little Venice. My eyes zeroed in on the steak but I resisted temptation and ordered their famous Summerhouse salad, a towering behemoth of baby leaf salad, cherry tomatoes, grilled chicken, avocado and Roquefort cheese. One of my colleagues ordered the same, and we have to admit we stuck to salads only because we really wanted to leave room for dessert, and am I glad I did! Here’s a picture of the knickerbocker glory I ordered and it was as delicious as it looked! The Summerhouse is exactly my kind of restaurant – it’s laid back and chilled out but beautifully appointed. More importantly, its food is classic and timeless; simple food done beautifully. They didn’t try to ‘jazz’ up our knickerbocker glory but simply let its own vanilla ice cream and strawberry sauce speak for itself …. yum yum! If you’re ever around the Paddington area and looking for a great, reasonably priced place for lunch or dinner, I give the Summerhouse a big two thumbs up!